My heart begun to beat very fast when I recieved the news from the Jakarta office, that I was to be transferred to Makasar, South Sulawesi. Leaving your wife and children for work reasons is never easy, but a new job brings new knowledge and experiences, as well as the opportuity to experience the beauty of birdwatching in Sulawesi. I started my work in Makasar at the end of April 2016, I did not forget to bring my camera and a book entitled “A guide to the Birds of Wallacea” written by Brian J. Coates & K.David Bishop. I was fascinated when I opened this bird book and and I started to make a list of target birds I planned to observe and photograph. 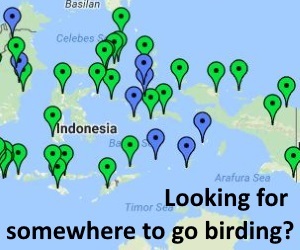 I started by asking around about the birding locations in South Sulawesi, as it turns out, there are only two main locations: Karaenta and Gunung Lompobattang. Finally I had my first opportunity for birdwatching. Together with my new friends, we arrived at the Balocci village in the Pangkep area. Around 1 and a half hours from the city of Makasar. 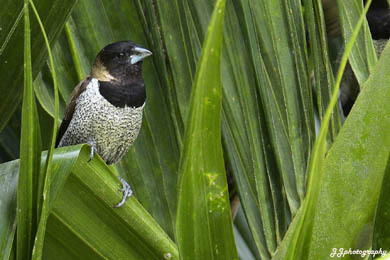 We did want to be distracted from our target, looking for endemic bird species! he Sulawesi Serpant Eagle (Spilornis rufipectus) was the first Sulawesi bird I managed to photo during this first photo hunting trip. Flying freeling amongst the blue sky, making its characteristic sound “keek” which it is reknown for. Then to my left I saw two little birds, white and yellow in colour chirping away. “…Ah its the Yellow-sided Flowerpecker (Dicaeum aureolimbatum) I said. As I continued to walk a little further, I also managed to photograph a Black Sunbird. Shortly afterwards I heard the sound “tok..tok…tok..” rather loudly, and as I searched for the source of the sound, came across a woodpecker. Whilst still in the same village, I successfully managed to photograph some other Sulawesi endemics: Black-ringed white-eye (Zosterops anomalus), Sulawesi Blue Flycatcher (Cyornis rufigastra), Sulawesi Hair-crested Drongo (Dicrurus hottentottus) and the Black-faced Munia (Lonchura molucca). Wow… not bad for the first birding trip, don’t you think? During another trip to the same location, I managed to come across Piping Crow’s (Corvus typicus) as many as 3 birds. These crows white and black in colour, are becoming hard to find because of rampant hunting and the illegal pet trade. I also managed to get a few other birds, like Yellow-billed Malkoha (Phaenicophaeus calyorhynchus), Sulawesi Myna (Basilornis celebensis), Sulawesi Hanging parrot (Loriculus stigmatus), and a bird that is very beautiful and rather extraordinary, the Black-naped Fruit Dove (Loriculus stigmatus). The first impressions were very promising. 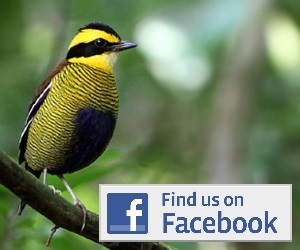 This is one great location in South Sulawesi where you can find many endemic birds. During times when I miss my family and I can’t return to the capital city, here is where I can spend my time and I will come across beautiful birds right here in South Sulawesi. berharap sekali waktu bisa ke sini..